The history of every breed demonstrates man’s evolution and its utility for work or appearance. The spotted dog has been a close companion to man and horses as far back as ancient records. An Egyptian painting pictured a medium-sized dog with black spots following the chariots. Bewick’s Quadrupeds illustrated a Dalmatian serving as a guard dog with his appropriate brass padlocked collar and cropped ears that were the fashion. In medieval England, the Dalmatian was bred for coaching, accompanying the carriage as an ornamental appendage. He served as a guard dog for the horses and carriages, and as a watchdog against robbers and thieves when traveling on long journeys. In his native land “Dalmatia” he served as a Spanish Pointer and performed the task well. Historically, over the years the Dalmatian evolved to become a multi-purpose breed acting as a coach dog, watchdog, and a guard dog. As for origins, it is hard to verify of which breeds the Dalmatian descended. Several are strongly believed to be progenitors with the Istrian Pointer, this being the most likely as he possessed Pointer characteristics marked with small black patches and tickings and was a generic dog minus exaggerations. Others highly suspected were the Le Braque de Bengale, the spotted dog from India and the ancient Talbot, preeminently a hound-like guard dog. Clifford L.B. Hubbard, the author of The Dalmatian, believed that the breed is most likely a direct descendent of the Istrian Pointer. The Istrian may have been the result of a crossbreeding between a small Harlequin Great Dane and Pointers native to that region known as Yugoslavia. The Istrian’s speckling of the ears with deeply pigmented nose, lips, and eyeliner appears to be blood evidence. The book reports that the modern Istrian is a short-haired, white hound, but smaller than a Dalmatian (18-23 inches at the withers), with coat markings that do not predominate. Located in the northwestern section of the former Yugoslavia, Istria lies next to the Dalmatian’s country of birth, Slovenia. Nevertheless, what we do know of the Dalmatian’s ancestors is that their markings, patches, lemon, grey and blue spots, and tricolors — all of which are still presently inherited — are disqualifications by today’s breed standard. About 1850, the introduction of dog shows in England created a passionate enthusiasm for fanciers to create distinctive breeds. Hence, they fashioned blueprints for each breed. 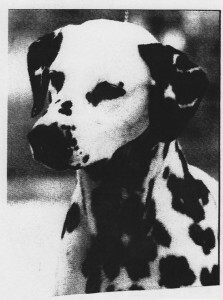 In 1890, the English Dalmatian breed standard was established portraying him as a multi-purpose Guard, Watch, and Coach dog with the American Kennel Club recognizing the breed in 1950, with the same standard. Although the Dalmatian’s distinctly even markings do not give him strength and endurance, they engender him as a recognizable breed; an evenly spotted dog. The final creation of the Dalmatian is a distinctly spotted dog, alert when posed. His off-square body is strong and muscular, symmetrical in outline without exaggeration or coarseness. Though his original functions are obsolete, the standard was written with these purposes in mind. The blueprint places particular importance on endurance, strength, and the ability to withstand stress and fatigue. 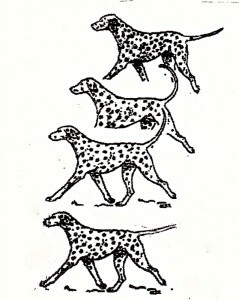 The breed pioneers creating the homogeneous Dalmatian strove to eliminate the inherited Pointer characteristics which, interestingly, still affect the breed today. Hackney movement, head carried high, patches (a disqualification), slanting toplines, and steeply angled tuck-ups are all faults that were written out of the original standard. There are two kinds of canine study: the surface or appearance of visual breed characteristics; and the working parts beneath the surface. Appearances influence eye appeal. However, understanding the elements lying beneath the skin, along with their actions and effect, enables us to assess the value of that which meets the eye. The head is the hallmark for almost every breed and further distinguishing its inherent qualities. The Dalmatian’s skull must have overall balance with its strong, off-square and muscular body, neither too large or small, nor too coarse or fine. It should appear broad and sculptured with definite angles and smooth planes. Of fair length, it is as broad as it is wide with a vertical furrow located in the center. The cheeks are flat blending into a strong muzzle of equal length running parallel to the top of the skull. The moderate, well-defined stop positioned at the junction of the frontal sinuses of the skull form a broad, definite brow over the medium-rounded eyes. Eyes that are set apart — facing forward — allow frontal vision of approximately 180 degrees. Notably, a lack of stop changes the position and shape of the eyes. Absence of pigment of the eye’s rim and on the leather of the nose are a major fault. The ears are of moderate size, thin and fine in texture, set rather high on the head and close to the head. When the dog is alert, the ears are even with the top of the skull. The Dalmatian’s broad head joins an arched neck of fair length at the beginning of the cervical vertebrae. The connection of head and neck is supported by well-developed muscles and ligaments that provide strength and accept responsibility. These allow body movements, turning from side-to-side motion and aid in the center of gravity and equilibrium. These ligaments also assist in the proper carriage of the head as well as raising and lowering of the head. The construction of the neck includes seven vertebrae with the first being the “Atlas” joined to the back of the skull allowing a hinge-like movement of the head, or “Yes” movement. The second vertebrae the “Axis” joins the first allowing for rotary or the “No” movement. The final five vertebrae form the “S” shape curvature of the neck’s backline. The first two cervical vertebrae, the Atlas, and the Axis are the designated junction of the “Poll” that creates the prominent arch to the neck’s backline. This arch not only adds beauty but supplies the neck with structural integrity, supported by and of well-developed muscles and ligaments. A Ewe Neck, a major fault, though very seldom seen in Dalmatians is concave and weak, lacking the ability to control the “Poll.” Importantly, there is a correlation between the length of the neck and a correctly designed shoulder layback. Dogs with well-laid back shoulders usually have a sufficient length of neck, and dogs with straight or upright shoulders appear to have short, stuffy necks with excess throatiness. These last mentioned dogs have shorter, thicker vertebrae and muscles and also lack a fluent arch or poll. As a result, this boxiness detracts from the appearance and provides for poor head carriage. Conversely, a long, exaggerated neck usually is narrow and weak and it too lacks a strong arch or poll while composed of longer-shaped, cervical vertebrae and finer muscles. Beneath a correctly arched neck is a significant cervical ligament made up of a long, elastic cord with the ability to expand and retract. This flexible apparatus not only supports, but also contracts and relaxes the head with pulling up and lowering movements. This cervical ligament is made of two parts. The first is the cord running along the top of the neckline, from the base of the skull to the first and fourth thoracic vertebrae becoming part of the vertebral column, the spine. The second part is a thick web running from the four cervical vertebrae attaching themselves to the fourth vertebrae of the canine thorax. The neck also has a substantial, but slender muscle termed the “Brachiocephalic.” It originates at the base of the skull while running down both sides of the neck ending at the rear portion of the upper arm as depicted by the dark band in the accompanying illustration. This muscle governs and facilitates the forearms forward and backward reach. The relatively long, arched neck joins the firm and level back starting at the withers continuing over the smooth shoulder and mid-back. This unbroken line begins to rise over the loin of broad width and ends at a nearly level croup. The topline, or technically the vertebral column, consists of 23 vertebrae; 13 withers containing the back and mid-back we refer to as the Thorax; seven loin vertebrae or lumbar and three fused vertebrae known as the croup. These vertebrae are of various lengths, widths, and angles combined and arranged to form a level and a strong back with definite and distinct curvatures. The illustration of a level back is due to different heights and changes of direction of the vertebrae. When posed, the back-line must be flat from the withers to the tail set. Any variations such as a hollow, camel or roach back, or the faulty, sloping pointer backline from the withers to the tail are all weaknesses. When in motion, the dog’s carriage and backline are also a breed identifier with the head carried slightly above a level backline at 9:30 to 10:30 on the clock. 101: Canine anatomy. The dog’s body is made up of two parts: the forequarters and the hindquarters that are connected by the mid-back, technically the anticlinal vertebrae, which allows for the up and down flexion and extension movement. The forequarters are manufactured by shoulder blades or scapula, the upper arm or humerus, the front legs or forelimbs, and the pasterns joined to the foot. 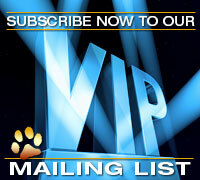 The active thoracic assembly carries 60 percent of the dog’s weight including the rib cage and forelimb assembly. The dense, straight bone of the front legs must be assembled in the proper position to obtain overall balance. The best possible forequarter assembly has shoulder blades angled at 45 degrees to the horizon. When combined with the upper arm at the point of shoulder, the scapula fashions an angle of approximately 90 to 110 degrees. To ascertain the preferred and proper placement of the front leg, envisage an imaginary line dropped from the highest point of shoulder. This plumb line should intersect with back of the elbow and land at the back of the front feet’s large communal pad. The vertical measurement created by this imaginary line is also considered the dog’s height measurement. Of considerable importance is the slightly angled pastern or metacarpal providing flexibility and shock absorption as joined to the round and compact foot with well-arched toes and thick pads. We do not wish to see tight toes such as that of a terrier. This most valuable combination of pastern and foot shape are instrumental for stamina, withstanding fatigue and providing stress resistance. 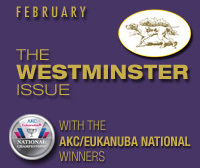 Weak pasterns and feet will create strain causing a breakdown involving lameness. Bear in mind that faulty front-end structure not only interferes with movement, but causes overall weakness as the forequarters struggle with carrying the ribcage and body weight. The thorax section or 13 vertebral columns of the back is the designated area to carry the ribcage that itself has many functions related to the Dalmatian’s stamina. The thorax construction is a column of 13 vertebrae joined by 13 ribs, including the floating rib on each side joined at the bottom by cartilage to the sternum. This area must be well-developed and stable as it protects the vital contents behind the ribcage being the heart and lungs. The first five ribs are a flat surface for the shoulder blade to rotate over while the remaining ribs are well-sprung. It is imperative to stress the importance of the ribcage’s shape as it pertains to and houses the diaphragm and respiratory actions. The cage’s shape allows room for a bellow-like action necessary for breathing. This membrane also acts as a supporting structure for the forelimb assembly and, in conjunction with the ribcage, determines the width of the dog. The eighth or ninth rib’s center curve width determines the shape of the ribcage. The desirable heart-shaped ribcage must exhibit well-sprung ribs of moderate width and depth with a chest or brisket reaching the elbows. There must be no tendency for barrel-shaped ribs which are short and round, or flat, narrow rib bones (slab-sided) that crowd the vital organs and shorten the diaphragm. A well-sprung rib cage with a deep brisket comfortably houses the vital organs and diaphragm composed of elastic, muscular, tendon sheets. These processes supply the energy internally to the working parts of the dog, and it is essential that they operate correctly for overall health and staying power. The desired underline of the illustration on the next page in Figure 1depicts the desired rib cage curving gradually into a moderate tuck-up allowing the heart and lungs to rest comfortably on the sternum or brisket. Foremost, the heart and lungs space is secured more by depth than width. The extended diaphragm fits snugly against the lungs to activate proper breathing. An underline with an abrupt or a steep sweep to the tuck-up crowds the organs and shortens the diaphragm consequently affecting expansion, making breathing more difficult for the dog. Located at the end of the rib back and beginning at the last or floating rib is the lumbar or loin area. This region of seven vertebrae is muscular and slightly arched forming a rise, but the gentle rise is not to create a roach or camel back. The loin’s principal function is to transmit force from the hindquarters to the forequarters aiding in the dog’s movement. The final section of the back is three fused vertebrae called the sacrum attaching to the last lumbar vertebrae and the first of the coccygeal vertebrae of the tail. The sacrum’s function is to fasten the spinal column to the sides of the pelvis Ilium by cartilage forming a strong union allowing for a direct transverse of forces from the hind limbs to the backbone. Slanted or flat, the angle created by this sacrum, otherwise referred to as the croup, has a considerable influence on the interpretation of the tail set, such as being low set. It is important to grasp that the angle of the croup is independent of the angle of the pelvis. The sacrum should form a nearly level line with a slight downward dip of the tail. The tail is a continuation of the Dalmatian’s topline carried with a slight upward curve. It is never curled over the back or to have an equally unpleasant ring shape as these, along with a low-set tail, are faults. A correct tail set aids the Dalmatian in locomotion and is a barometer of his temperament. The dog “thinks with his tail” and its actions indicate his mental state. A wagging tail is a sign of happiness and outgoing attitude. A tucked under or limp tail indicates an unhappy dog and is a sign of insecurity or shyness. The construction of the locomotive hindquarters is the pelvis, femur, stifle joint, tibia and fibula, hock and rear feet. The pelvic girdle is strong and muscular coordinating with and delivering force to the forequarters. This momentum produces extended forequarter reach in a smooth, effortless action while alleviating stress and minimizing fatigue. The preferred hindquarters are discovered by envisioning the same previous imaginary plumb line dropping down from the pin or seat bone. This line should land just in front of the toes of the rear foot. A well-bent stifle has an influence on the natural and comfortable placement of the rear feet. A faulty, straight stifle places the rear feet forward of this imaginary line, and conversely, the over-angulated and exaggerated stifle places the feet too far behind the ideal drop point. An over-angulated rear also is usually accompanied by “cow hocks” that are a major fault. A typical hindquarter is constructed with a 30-degree sloped pelvis and the attachment of the tibia and fibula to the femur forms a 90-110 degree angle. This excellent engineering sets the hock low to the ground concluding with a round, compact foot. Remember, faulty pelvic structure is unable to transmit full force to the forequarters and straight stifles and cow hocks produce inferior movement. In 1949, while a young man, I ventured into showing and breeding Dalmatians under the kennel name “Dalmatia.” During these early years, there were two Dalmatian construction styles. One was well-balanced with a strong and muscular body of sufficient bone. It had a level topline with a gradually curving underline to the tuck-up and was pleasingly spotted. While in motion, it was smooth and effortless, illustrating hardiness. The other Dalmatian shape was pretty but with refined bone appearing tall, short-backed and sometimes sloping. He had an abrupt underline when posed and his head was carried high when in motion. Then and now, there were and are breeders and judges who still remain partial to this style of construction. Taken as a whole and fortunately for the Dalmatian, few exaggerated anatomy trends have affected it over these many decades, although that cannot be said for various other breeds. Having said this, there are valid concerns about this breeds one-of-a-kind attribute –?his spots. Throughout his history, the Dalmatian has quickly been identified by spotting and coloring of different patterns. From the Istrian Pointer’s body covered with small, black patches to the La Braque de Bengale’s spotting, heredity has designated certain characteristics for transmission from generation to generation. Presently, we see Dalmatian coats with many arrangements of spots. They range from the preferred round, well-defined spots sized from a dime to a half-dollar, to the faulty, large, over-marked clusters of color intermingled with even more black groupings. As a result, there is a massive amount of black on the dog’s body. Witnessing these faults of the present is a warning by Mother Nature to breeders and judges as to what will happen in the future. Picture a nearly black dog shaped more like a Pointer, a style we already see on occasion in the show ring. Due to the conflux of heavy clusters or large color masses together in one area, parts of the dog’s body appears as if he is solid colored, nearly pinto patterned. With such increase of color, we will not be able to identify the Dalmatian as a unique breed of individual spotting. Posted by ralbee on Jul 17 2015. Filed under Current Articles, Editorial, Featured. You can follow any responses to this entry through the RSS 2.0. Both comments and pings are currently closed.